Today I was Anneka Rice for a while! 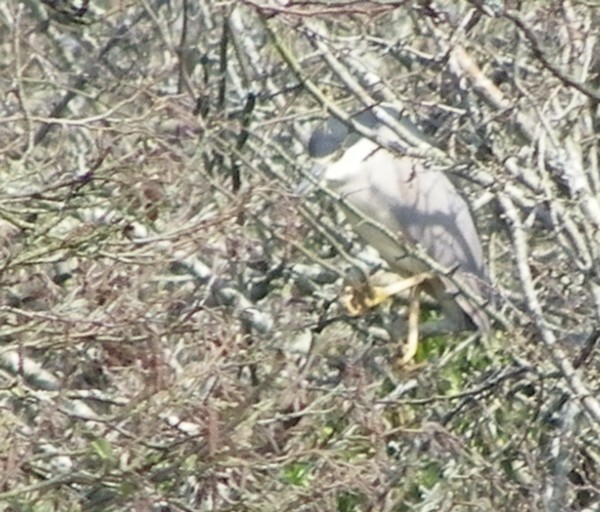 Got a call about an adult night heron in skibbereen late morning and had a tricky decision to make as I only had an hour before the school run. And skib is 30 mins away. Feck it. I went. And skib is actually only 20 mins away! Who knew? Anyway, with the town centre jammed, and the clock ticking, I switched to HMU mode (highly mobile unit). Hoofing along the pavement, knocking grannys out of the way, whilst on the phone to Julian for directions, I realised I was Anneka Rice in Treasure Hunt - that tedious race-against-the-clock pointless excercise that used to be on Channel 4 years back. Just as the clock was nearly run down, I found the secret passageway that Julian was on about, and hey presto - there he was! Shortly afterwards, once I'd stopped gasping, I even managed to see the heron! Yes indeed, back in the territory of piss-poor record shots! Bird duly ticked, it was back to the jogging and cursing and knocking over grannys all the way home, and even made it to the school with 2 minutes to spare. Happy days.